Some Amazon Alexa users are currently having problems reaching the voice assistant. Instead of reacting to commands, Alexa simply says “sorry, something went wrong.” Amazon hasn’t commented publicly yet on the issue. Based on tweets and Down Detector, users began having trouble reaching Alexa around 7AM PST. While some had their connection issues resolved quickly, many others are still waiting. #AlexaDown ! Now I have to remember how to turn the lights on and off again! This follows an outage last month that mainly affected Echo devices in parts of the United Kingdom, Spain, Germany, and Australia. 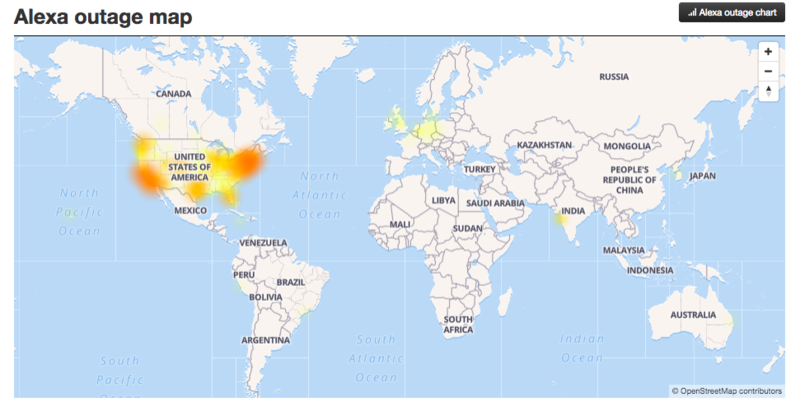 According to Down Detector’s outage map, however, most of the users who currently can’t reach Alexa are in the United States. Alexa also suffered an outage in March after an Amazon Web Services networking issue.